3.1 Does she dye her hair? appearance of what would become her common outfit, with later games depicting a Zelda wearing a similair outfit. The blond-haired, blue-eyed Zelda design continues. As a child, she wears pink over a white dress over a blue, long-sleeved shirt. Rather than a tiara, Zelda wears a cloth hood, with a golden crest featuring a Triforce symbol. Her necklace is gold, but holds a red stone in the center. She also sports a gold belt, and golden bracelets. As an adult, Zelda wears a golden tiara with a red stone. Her dress is similar in colors, with more blue in place of pink. She wears Triforce-shaped earrings. Both as a child and an adult, Zelda's outfit bears the mark of the Triforce and the Hylia Mark. Psychologically, Zelda is possibly the most complex character of the series. She is really wise, even before she becomes the holder of the Triforce of Wisdom. She is, however, quite imprudent, revealing herself as the Seventh Sage in a place where she can be captured (and in fact, is). From her dependance of her attendant Impa, she evolves to become a strong woman able to escape from Ganondorf for seven years, by disguising herself as a man. She becomes a warrior, someone able to fight and do her own heroic deeds. But then, she becomes as weak as she was when she was a child, dependant on the help of Link. She is a strong leader. Even as a child, she's interested in matters of government. She does everything to protect the beautiful land of Hyrule. When she introduces herself, she emphasizes her right to the throne: she's not just Zelda, but Zelda, the Princess of Hyrule. She is also highly educated. She knows many (if not all) of the legends of Hyrule; she can write poetry; she can play two instruments, the ocarina and the harp. She is a master of human feelings. Strong, but weak; wise, but imprudent; sensible, but naïve... Zelda in OoT is a world of contradictions. The Zelda of MM is the same as the one of OoT. Her appearance is, because of this, the same as the child Zelda from OoT. The only difference is that she appears just in black and white. Zelda is the beloved only daughter of the (possibly) widow King of Hyrule. As the true heir to the throne she's been instructed in all the legends of Hyrule, legends she know perfectly. She is entrusted with one of the four keys to the Sacred Realm, The Ocarina of Time. Since her birth, she has been protected by her muscular attendant, Impa the Sheikah. One of her functions was to play the ancient and mysterious melody passed down the Royal Family as a lullaby for the princess. Maybe because of this, she started to have prophetic dreams that were never wrong. The divination powers of the princess were quickly spread in all Hyrule Castle Town. In her dream she also saw Impa, who had the role of teaching the melody she had used as Zelda's Lullaby to the boy from the forest. She also was able to understand who the dark clouds represented in the dream, Ganondorf, the leader of the GerudosShe told the dream to her father, to whom Ganondorf has swore allegiance, but he didn't believe it was nothing more than a mere dream. While Zelda is spying Ganondorf through a window, Link arrives to the Castle Courtyard looking for the Princess of Destiny. Zelda immediately recognizes him as the forest boy from her dream, and asks him whether he has the Spiritual Stone of Forest, the shining green stone of her dream. She tells her what she has dreamed and her suspects about Ganondorf. She plans how to protect the Sacred Realm from Ganondorf, so she commands Link to look for the other two Spiritual Stones while she protects the Ocarina of Time with all her power. By keeping away the four keys of the Door of Time from Ganondorf. That way he would never get the Triforce. She also gives him a letter to make him be able to go to those places that need royal permission. When Link gets the other two Spiritual Stones, the Goron's Ruby and the Zora's Sapphire, Ganondorf attacks the Hyrule Castle. Because of this, Zelda cannot wait for Link any more and has to flee with her attendant, Impa, to a place where Ganondorf can't reach them. 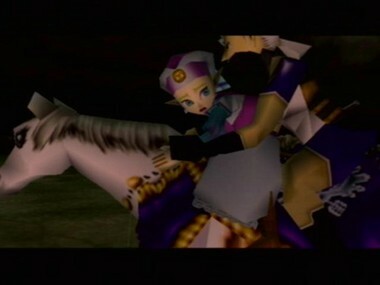 As Link arrives to the entrance to Hyrule Castle Town, he sees Zelda and Impa riding in a white horse escaping from Ganondorf. 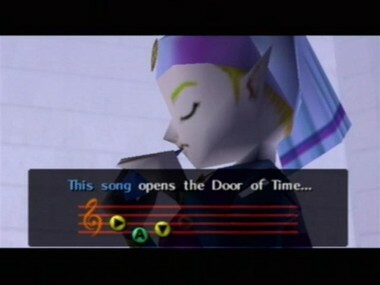 Not being able to give Link the last key to the Door of Time, she throws the Ocarina of Time to the city moat. After Link meets Ganondorf, he dives into the water, taking the Ocarina of Time, and receiving a telepathical message from Zelda where she appears in front of the altar of the Temple of Time and teaches Link the Song of Time. When Link pulls out the Master Sword from the Pedestal of Time something that Zelda didn't predict. Zelda didn't think that there was a fifth key to the Sacred Realm, the Master Sword, and that Link was the legendary Hero of Time, the only one able to pull the sword from its pedestal. Because Link isn't old enough to be the Hero of Time, his spirit is sealed inside the Chamber of Sages, leaving the entrance to the Sacred Realm open to Ganondorf. It's unknown where Impa and Zelda go after they escape from Ganondorf. It's possible that they stay with an unknown Sheikah community, where she is trained in Sheikah magic and techniques. When Ganonodorf gets the Triforce, the ancient prophecy passed down the shadow folk comes true. Because of Ganondorf's heart being unbalanced, the Triforce turns into three pieces: Power, Wisdom and Courage. While the Triforce of Power remains with Ganondorf, the other two, the Triforce of Wisdom and the Triforce of Courage go to the chosen ones: Zelda and Link. Zelda thus becomes the Seventh Sage, who is destined to be the leader of all them. Using the power of her Triforce, Zelda adopts the disguise of a young Sheikah man, Sheik. Although it's not known how much time Impa and Sheik stay in exile, presumably Impa went quite early to Kakariko Village, to protect it from Ganondorf. What Sheik does until Link wakes up, it's not known. It's possible that she swore allegiance to Ganondorf in order to be able to act with more freedom. She may have also collaborated with Impa at imprisoning the evil spirit of Bongo Bongo, but this is never mentioned. With her poetry and music, she teaches Link those things he couldn't learn when he was young. Her poems speak about feelings, young love, friendship... or tell the legends passed down the Sheikah folk, those about the Triforce, the Master Sword, the Sages, The Hero of Time and the temples. While Link is in the Temples, Sheik does deeds that counterpart those of Ganondorf: she rescues Rutro from the ice, she takes care of Kakariko Village while Link goes to Shadow Temple... But her most important function is to teach Link the warp melodies of the temples. The fact that Zelda is mentioned very few times before Sheik takes off her disguise helps to cover the secret. Zelda is only mentioned twice. The first time is when Link awakens Ruto as a Sage and she tells Link not to be discouraged, because she feels Zelda is alive. A more specific quote is that of Impa, after awakening as a Sage, where she tells Link that soon he would meet Zelda, and she would explain him everything. It is curious to see that, of the Six Sages, only Ruto mentions Sheik, but it's known that at least Rauru and Impa know her. Of them, Ruto doesn't know who Sheik really is, only Impa seems to know something exact about her. There is only one in-game clue that suggests that Sheik is Zelda. It comes from a Gossip Stone and says that Princess Zelda, contrary to her elegant image, is a tomboy! After Link awakens all the Sages, Rauru contacts with Link telepathically, asking him to go to the Temple of Time, where someone's waiting for him. This person is Sheik. Sheik tells Link an unknown legend passed down the Sheikah folk. A legend about the true nature of the Sacred Realm and the Triforce. She explains Link what happened when Ganondorrf got the golden relic: it divides in its three parts, Power, Wisdom and Courage. While the force Ganondorf trusted more, the Triforce of Power, the Triforce of Courage went to Link and the Triforce of Wisdom went to the Seventh Sage. Then Sheik makes her second and almost fatal mistake: using the Triforce of Wisdom she takes her disguise off, revealing herself to be the Seventh Sage Zelda. Then, she tells Link her plan to defeat Ganondorf. It's quite simple, Link would protect Zelda while she gathers the power of the Six Sages to seal Ganondorf in the void of the Evil Realm. For this purpose she gives Link a new weapon, one that can penetrate Ganondorf defenses, the sacred Arrow of Light. Then the temple starts to tremble. It's Ganondorf, who has heard all the conversation between Zelda and Link, so he knows who the holders of the Triforce are. He imprisons Zelda in a pink crystal and tells him to go to his castle to rescue her. Now Link's mission is to rescue the princess and that's what the Sages tell him to do. Once Ganondorf, Zelda and Link meet in the same room, the Triforce in their hands' backs shine, starting to recombine. After Link defeats Ganondorf, Zelda's imprisonment disappears, releasing her. She, after explaining Link why Ganondorf has died, she notices that he's trying to crash them inside the tower. Then she guides Link to escape from there, opening with her magic all the locked doors. Once they are out of the castle, they see how it is destroyed. But they hear a noise. It's Ganondorf, who still has enough power to use the Triforce and transform into a giant pig-like creature Ganon. After a long battle, Zelda uses her magic against Ganon, holding him while Link finishes the evil incarnation with his now shining Master Sword. Then Zelda creates a yellow energy ball, that is used as a portal for the Six Sages power, sealing him inside the Evil Realm. In the next scene Link and Zelda appear over the clouds. She apologizes to him and explains how all was a fatal coincidence, how all the disgrace was her fault. Then she asks Link for his Ocarina. For she, as one of the Seven Sages, can return him to his original time by using the Ocarina of Time. He gives her really slowly the Ocarina, after holding hands, and then she plays Zelda's Lullaby, making him return to the past. After the ending sequence it's seen how Link and young Zelda meet again. 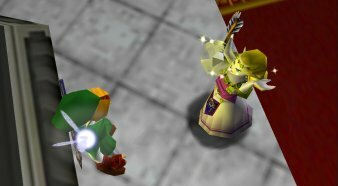 The only appearance of Zelda in MM is during a short flashback after he recovers The Ocarina of Time. She teaches Link the Song of Time. Zelda is the only person Link remembers from Hyrule and her name is asocciated with the treasure she gave Link, the Ocarina of Time. In the flashback Link remembers how (presumably) since he defeats Ganondorf at the end of OoT he has lived with Zelda, almost certainly in Hyrule Castle. But Link has to leave her, in order to find a friend long time gone. She lets him go, giving him the Ocarina of Time, and saying she would pray for him. In MM she's Link's only link to the person he was before. Does she dye her hair? In OoT there's a curiosity about her sprite, for both child and adult. Their eyebrows are green! Maybe she forgot to dye her eyebrows... This is not shown in her official artwork, so maybe it's just a mistake of the game designers . In OoT, when Link and Zelda are escaping from Ganon's Tower she is once imprisoned by a circle of fire that doesn't disappear until Link defeats the two Stalfos that appear then. After that, Zelda gives Link three hearts to heal him. If he has already alll the hearts full, she throws three Rupees. Take this stone with you. prophetic visions in her dreams? Wha-ha-ha! What a crazy guy! try to sneak into the castle to see Princess Zelda? I wanted to see Princess Zelda! I was almost there when they caught me! So you say you want to see Princess Zelda, eh? Go home! Get out of here! How did you get past the guards? Are you from the forest? Will you look through the window at him? Can you see the man with the evil eyes? hail from the desert far to the west. sure he is not sincere. They must symbolize that man! He has such terrifying power! We must not let Ganondorf get the Triforce! He shall not have it! You go find the other two Spiritual Stones! I am Impa of the Sheikahs. I am responsible for protecting Princess Zelda. Everything is exactly as the Princess foretold. melody to the one from the forest. He is under my orders to save Hyrule." Wah ha ha ha hah! You must protect the Triforce! You can't hide anything from me! Family... The Ocarina of Time! the Evil King and return peace to Hyrule. side and protect her on my behalf. It is I, the Princess of Hyrule, Zelda. was necessary to hide from the King of Evil. then the Triforce fell into Ganondorf's hands. Ganondorf the Evil King will end! Ganondorf back into the Sacred Realm. In order to do this, I need your courage again. Please protect me while I do my part. power of the Triforce of Courage! Then, I will become the true ruler of the world!! If you want to rescue Zelda, come to my castle! The Shadow Barrier is dispelled! your sword and deliver the final blow! consequences of trying to control the Sacred Realm. This page was last modified on 13 April 2006, at 12:56.